McFarlane Toys have revealed the much-anticipated Assassin's Creed Movie figure of Aguilar, portrayed by actor Michael Fassbender! This will be part of McFarlane Toys' new 7" "Color Tops Collector Program", showcased back in February during the Toy Fair 2016. "The 7-inch figure is modeled from 3D scans of Aguilar actor Michael Fassbender. The figure is part of McFarlane's new Color Tops series of collectibles. McFarlane Toys calls it "an exact likeness" of Aguilar. 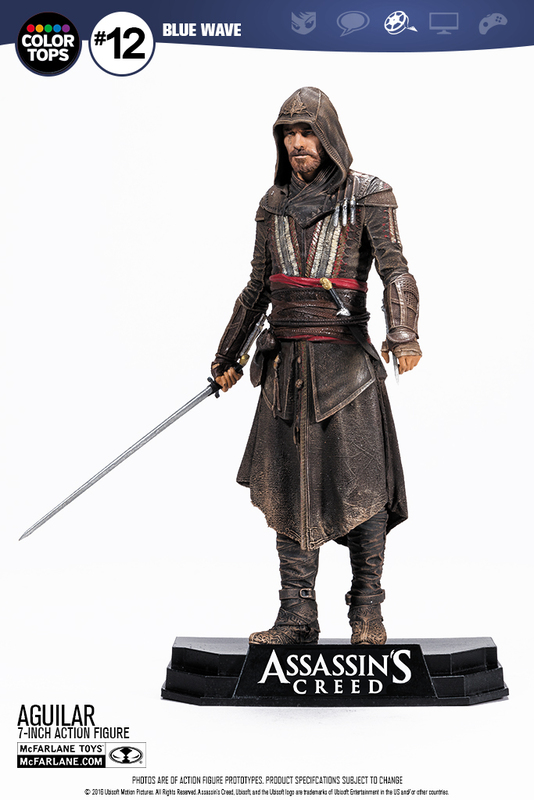 The figure includes an "Assassin Sword and Extended Hidden Blade," and also comes with an Assassin's Creed-branded display base. McFarlane Toys owner and CEO Todd McFarlane said Ubisoft is taking Assassin’s Creed "into real life," and his company plans to capture the move "by making our most life-like figures ever." Aguilar comes dressed in the same iconic assassin's garb as in the film, shown off most recently in the latest poster for Assassin's Creed: The Movie." The prototype shown above really does have the likeness of Michael Fassbender so here's hoping that the final product will be similar in quality. Also I'm very interested to know if other characters from the movie will be getting the figure treatment. Definitely a cool figure to have and this will surely appeal to fans of the franchise! 2 for me please!